And indeed, this story is far from over – I hear from a source that two more members of the Portsmouth Liberal Democrat Party, one allegedly a former city councillor, have been spoken to fairly recently by the Police concerning their continued harassment of ‘Annie’ online, and their potentially breaching the High Court Order which preserves Hancock’s victim’s anonymity for life. These would be criminal matters; but yet there are Portsmouth Lib Dems who seem unable to stop themselves from being able to show proper respect and sympathy towards a victim. These are the sorts of Lib Dems in Portsmouth who are loyal to GVJ. Of course people acknowledge the pure politics of the Portsmouth Labour councillors voting with the Lib Dems in order to remove the Conservatives from power in Portsmouth – or rather they acknowledge the pure cynicism of it – but there remains a profound distaste for the human cost of this manoeuvre. And there is a human cost – a real one – involving a young woman who was the victim of a senior Portsmouth Lib Dem politician. This is a young woman who is still on the receiving end of abusive, nasty behaviour from some Portsmouth Lib Dems, and who now feels profoundly distressed by the news that the man who claimed on BBC television that she was motivated by money in making her truthful complaint is now the Leader of Portsmouth City Council again. We know that #IBelieveYou, #IBelieveHer and #MeToo mean little to the Portsmouth Lib Dems – do they also mean nothing to the Portsmouth Labour Party? This is a question that Portsmouth Labour members now have to face, like it or not. 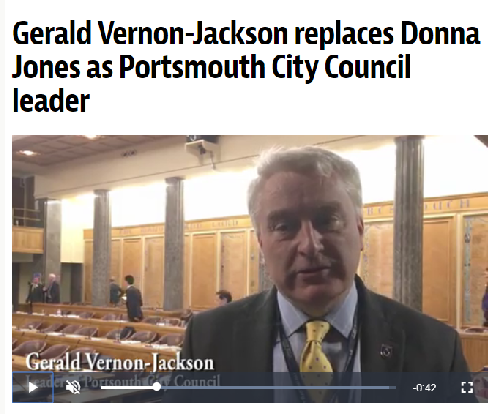 It’s the Liberal Democrat Group of councillors in Portsmouth of course who have yet again handed GVJ a significant lifeline, by keeping him as their Leader. Apparently now unelectable to a position of power on his own merits, presumably a consequence of his clear support for Hancock when others like me had said a very clear ‘Enough’, GVJ now owes favours to the Labour Group leader Stephen Morgan, who also happens to be the man who beat him in the last General Election to become the MP for Portsmouth South. Oh what a tangled web we weave. Other comments on social media last night and today are focusing on what Labour voters see as a real betrayal – basically, Vote Labour, Get Gerald. These are comments from the kind of people who actually bother to vote – ignore them at your peril. There are no actions without consequences. It doesn’t matter on one level who replaces GVJ as Group Leader in Portsmouth – they’ll now be tainted by going along with this, too, either too weak to have stopped it, or in full agreement with it. I don’t think Labour covers itself in glory either, sadly, with its emergent part in the narrative. And ‘Annie’? Well, to her I’ll say: this development, whilst unsavoury, does actually do something in your favour. It puts GVJ and by association the Hancock saga back in the spotlight, and that can only but assist your long quest for full justice. Memories of the Hancock saga are far from fading. Too many 'big cheeses' were involved. And indeed, GVJ’s seemingly teflon hide in surviving to float to the top again of polluted waters is itself nothing short of Hancockian.